CBC Sunday News is going to air a segment about urban chickens in Toronto on tomorrow morning's show (10am in Toronto) in the first hour of broadcast. As you'll recall, last week I put out a request on Twitter and Facebook for urban chicken farmers in Toronto to get in touch with Natalie at CBC Sunday News for a story they were working on. Natalie sent me a note this morning to let me know the segment is, indeed, scheduled to air! While I can't get the CBC signal here in California, I'll be watching the archive of the show online at the CBC Sunday News web site. 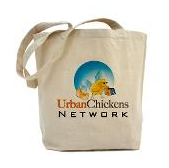 I tell ya, I'm really impressed with how much air time urban chickens are getting on CBC. You'll recall I made my radio debut on CBC's Spark program in 2007 and CBC's The Point did a bit about chickens just a couple months ago. Here's hoping there's more legal urban chickens coming to a Province near you!